Mark Hobin, Shemoviegeek and Arcturus convene on the MGCTv show for a movie review this week. We discuss this year’s #1 animated film THE CROODS. It’s a big hit, but was the crew won over by the family fun? Listen to find out! This entry was posted on April 11, 2013 at 8:01 pm and is filed under Podcast with tags podcast, The B.A.N.G Show. You can follow any responses to this entry through the RSS 2.0 feed. You can leave a response, or trackback from your own site. I enjoyed your podcast about Life of Pi, but sadly not this one ; because of how the film was discussed. i think The Croods deserves some more credit. Do animated films always need to have original stories? I think one of the beauties about movies is that it has the option : It can be good because of How it’s presented, and not just what is presented. The Croods has beautiful and immersive animation. 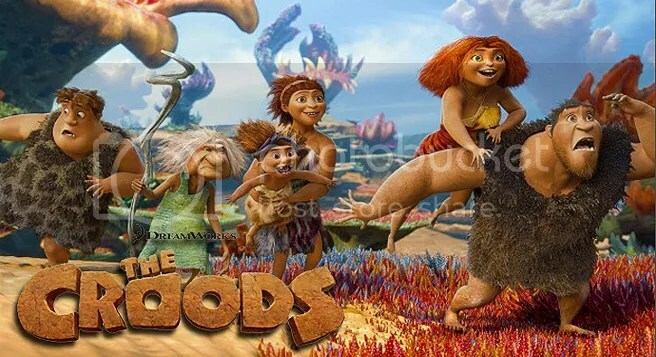 Ok, the Croods has stock characters; But its a primitive take on them, which makes them funny. Also, the constant mention about it being for kids. I think the companies themselves, Pixar and Dreamworks create products primarily for Children. Naturally i respect yours and the others opinions. but I have just been beginning to feel that expectations for these animated films are slowly growing too high. The expectations for animated films are high because we know just how great they can be. I think we did a good job at explaining the issues we had. I gave this a recommendation and I mentioned the beautiful animation, so I don’t feel we differed all that much.